Greeting cards are a great way to send a warm message of love on almost any occasion. Our Easter greeting cards make it easy for a child to color or paint a hand-crafted card and deliver a biblical message about Jesus and the resurrection all at the same time. 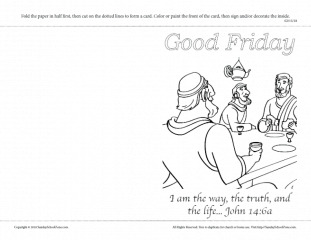 This Good Friday greeting card with John 14:6a will remind the child and the recipient that Jesus is “the way, the truth, and the life.” Jesus shared these words with His disciples the night of the last supper just hours before His crucifixion on Good Friday. We have a number of Easter (Resurrection Sunday) greeting cards that can be colored or painted and decorated that also have a relevant Bible verse printed on the front. You can also find a list of related short Bible verses on our site that the child may wish to write on the inside of the card. (Younger kids may need your assistance.) We also have other Easter related activities and resources on the site to help kids think about Easter and all of the related events in a biblical way.